On this last day of the year and the decade, I wanted to wish all the Reporting Blog followers and all 2009 visitors a very very Happy New Year. The Reporting Blog has increased in readership every month during 2009 and retweet levels, facebook comments and direct approaches to me by email are increasing. The Blog feeds into Chloregy and The Green Economy Post, Alltop and other sites from time to time. Reporting has featured in Alex Harris's wonderful Reputation Report and the CSIC Blog with Sherie Winston and we have guest posted on Peter Korchnak's Sustainable Marketing Blog. Fabian Pattberg picked the Reporting Blog as a recommended website., and Chris Jarvis listed the Reporting Blog as one of the top 10 CSR blogs in his now famous list of 51 sites for CSR. We have had feedback and conversations online and offline from all over the globe, and generally enjoyed being a part of the social media buzz in 2009. Thank you to everyone who is giving air-time and energy to promoting the CSR and Reporting message. Thank you for reading the Reporting Blog and for all your recommendations and interactions. Thanks for inspiring me to write. 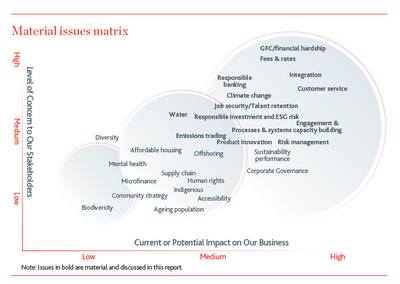 My limited powers of analysis deduce from all of this that there is a healthy interest in csr and sustainability and reporting themes, and how they relate to the way we do business and contribute to a better world. I hope this will continue in 2010, and that the Reporting Blog will continue to be a useful resource for many, and an anlytical, sometimes critical, sometimes very critical look at CSR and reporting themes, but always a reporting advocate, adding an occasional touch of humour, or a dollop of virtual Chunky Monkey, to all those who land on its pages. BEST of the FUNNIEST of 2008/2009. Santa's CSR Report - i am not sure Santa found this funny. Chunky #CSR Monkey - about sustainable ice cream YEAH!!!!!!!!!!!!!!! What's your financial personality? - and who locked the fridge? The Reporting Wishlist for 2010. When you read and review as many sustainability reports as I do, you begin to wish that all reports would provide a certain basic level of, well, level. Here are just a few of the things I would like to see in CSR and Sustainability Reports in 2010 (in addition to, not in place of, what is). So first on the 2010 Reporting WishList is the Materiality Matrix. Let's face it, if you have written a report and no-one has given any feedback, you didn't create enough BUZZ. And if you're report ain't buzzin, then neither are you. If the whole point of a report is to serve as a platform for generating stakeholder dialogue and feedback, then please, reporters, make sure you get some. And please report on this feedback and how you related to it in your upcoming report. Like Daiichi Sankyo. How I wish all these l-o-n-g reports would clearly identify what is different about the new report from the last report. If the reporters are going to regurgitate lots of prior content for completeness, and in some cases, this might make sense, my wish is to see these "and-this-is-something-we-prepared-two-years-ago" bits clearly highlighted. So that I dont have to read them again if I don't want to. And so that I can focus on what's new and relevant. If at all possible, all reports should contain new, fresh, up-to-date material, which represents the DELTA. And explain the DELTA. If some of last year's objectives dropped off the end of the desk, never to reappear, and new ones grew horns, I would like to know that. I don't want to have to search. If you have changed your employee headcount methodology, or electronic waste weight calculation, please do enlighten us. Make the DELTA (and the differences) clear so that the reader can get a clear picture. Another mantra of mine is that employees must engage with the reporting process and the report. This is one of the best ways a business can gain true value from reporting, and use the the process as a way to drive sustainability performance. Why Companies don't measure how many employees read the report, or take any form of interest in the report, continues to astound me, as I have previously blogged. I wish to see reported, in reports published in 2010, the number of employees who have, in some way, read, responded to, asked about, worked on, discussed, presented, or in any other creative way (ok, dont let your imagination get out of hand), engaged with the report. Ideally, I would like a metric: the number of employees that have read the report. Most Companies know how to survey employees. Get the data. Just by surveying, the number will increase. I wish to see more employees valuing the CSR report as the useful working document it should be. You know how I feel about assurance statements. Enough said. I want to see better assurance in 2010, for all non-first reports. OK. Correction. Significantly better assurance. And I want to see the Global Reporting Initiative stop awarding + for anything that doesn't even remotely ressemble a relevant Assurance statement. I wish to see more people's faces in 2010 reports. Not just any faces. Not just the faces of the CEO and the Chairman, and not the stock photo faces that look like Stingray people. I wish to see more faces of more people who work in the organization and who have contributed to the report, or to the work that has made the report possible. I want to feel that these people are talking to me, instead of an anonymous reporter who is producing a standard marketing glossy.People make the report come alive, and they deseve recognition in the report. So slap a little powder on their faces, mascara for those that wish (Chairman included), set the zoom and get off to their workplace with the digicam and click when they smile. Oh, and write down what they say. It's probably much more interesting than what you were planning to write in the first place. So come on, reporters, make my wish come true in 2010 and let's have the Full Monty. (well, faces, not ... er... you know). Any Reporting Blog readers have a wishlist? Don't be shy. Post a comment with what you would like to see in 2010 CSR and Sustainability Reports. And remember what the glorious Maya Angelou said: Ask for what you want and be prepared to get it. Ethical Fashion - Who cares ? Designers - to what extent do ethical, social and environmental considerations form an early part of the design phase? Retailers - to what extent do similar considerations dictate retail policies and practices ? Consumers - to what extent do consumers vote with their feet, or more accurately, their purchasing choices? There are many positive examples in all three categories of fashion industry stakeholders such as these, though, overall, the fashion industry is still a perpetuation of unsustainability, especially in Israel where 90% of fashion is imported and little is disclosed about supply chain processes by almost all the leading retailers. Materials - fabrics, yarns, adhesives, dyes, and all forms of accessories - what environmentally friendly and ethically favourable choices are available to the fashion designer ? Production processess and supply chain - sourcing, outsourcing, transportation, sales, fair trade - what influence does the designer have on manufacturing complexity and waste levels, for example ? Garment care - what the consumer does after purchasing a garment, which makes up a significant element of the garment's total life-cycle impact, often greater than the impact of producing the garment. 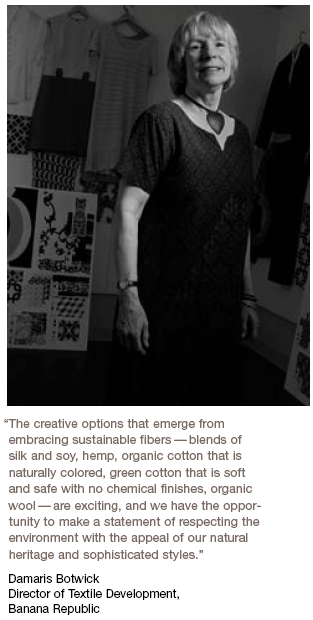 I then I ran through a reasonably exhaustive list of issues for consideration by designers including fabric traceability, organics, garment life-cycle, labelling, issues related to body image, use of pesticides, models and modelling practices, technology developments which facilitate use of environmentally friendlier fabrics such as hemp, and more. Finally I looked at the question of transparency and yes, you guessed it, my favourite subject, reporting, and talked about the leading reporters in the fashion industry, including the only private fashion house in Israel to have produced a CSR report, my client, comme il faut. I mentioned the Global Compact, and our efforts to drive the Israeli fashion industry to accept and promote the UNGC Principles, though only the comme il faut Company has done so to date, and one more en route, whose first Communication on Progress we are currently working on. To sum up, I stitched it all together (don't you just love puns?) and suggested that if they care, they should take responsibility, as designers, and consider social and environmental issues at the start of the design process. Perhaps if I ever become a celeb, one of them might design an eco-celeb-outfit for me. Chunky Monkey colours, please. I waited as some rushed to copy down the titles. Good sign! Quick look at one more: Next plc, whose 2009 report I just came accross a day or so ago. It's an interesting report, doesn't really touch on the role of the designer, thoough there is evidence that designers are bound by social and environmental commitments such as the development of traceable sustainable cotton products and more. I hope that this new generation of designers will be a generation of sustainable designers. And I hope that consumers will both demand and applaud this direction. That is, if anyone cares. what are csr consultants good for ? You are about to develop, or rethink your Sustainability strategy. You are about to devise a program for advancng women in your business. You are about, finally, to write your carbon management policy. You are about to conduct, for the first time, an encompassing stakeholder engagement and dialogue process. You are pouring over your materiality analysis and wondering how to pioritize all those issues that came up. You are responding to queries from the CFO regarding the return on investment of the Company's community involvement program. You are wondering what the competition are doing in the CSR and sustainability space. You are contemplating a cause marketing campaign to boost sales and help the community. You are about to write your first CSR report. Or your second, Or your third. Or your thirteenth. Any of these hit home? Because the next question is tougher. Should you hire a consultant? After almost twenty years as a practitioner, I have now been a consultant for the past 5 years. Actually, I never held very high views about the contribution of consultants. You know, like the jokes.For example: Consultants are like people who borrow your watch to tell you the time and then walk away with it. Or the one where the consultant starts off to help become part of the solution and ends up being part of the problem. So why did I become a CSR consultant? I won't bore you with the biographical details, but now that I am one, I believe I add value. In fact, my clients believe I add value. Recently, a potential new client, a CSR Manager, asked me to help formulating a response to internal challenges such as: What do you need a consultant for? Why can't we do CSR in house? Prove that we need a CSR consultant!! Hidden in these challenges are basic questions (doubts?) about the value of consultants in any business activity, but also the view of CSR as a profession in its own right with specific areas of expertise. CSR is not something people do because thay have nothing else to do. Or because they are altruists. It's a profession like any other. Developing and evolving, but it is a profession. Use your internal resources for core activities. Consultants provide expertise which is not present in the organisation. It doesn't need to be present in the organisation. No CSR Manager of any business can be an expert in everything that is going on in the world of CSR, and doesn't need to be. The CSR Manager should be driving assimilation in the business, using a range of tools (which may include external proceses). The CSR Manager's job is about building CSR capabilities in the business. This needs different knowledge, skills and competencies than those a consultant brings to the table. Consultants are focused in their area of expertise. If they are good, they spend almost as much time maintaining their knowledge and updating their frames of reference as they do imparting it to clients.That's their core business. In the field of CSR, this means keeping abreast of daily developments and changes in the CSR/Sustainability landscapes, understanding the latest revision of the AccountAbility standards, knowing the content of the latest ISO26000 draft revision, knowing which Sector Supplements the GRI has issued, knowing who won the CRRA 10 reporting awards (ha! Gotcha, the voting is still on),knowing the EICC exists for relevant clients, or the UNPRI, or the Equator Principles, or the UNGC, CEO Water Mandate, knowing who tops the CDP list, knowing which conferences are happening , knowing the outcome of COP15, and its potential impact on business and the low-carbon economy (ok, that wont take long) knowing which are High Purpose and which are Vanguard Companies, knowing the state of upcoming green legislation in your country, and knowing what's trending and how to leverage what's trending . And more. This reminds me of Malcolm Gladwell's brilliant book, The Outliers. The idea is that you dont get to be top in class at something because you were in the right place at the right time. You get to be an outstanding achiever because you invested hours upon hours of developing your knowledge and skill. That's what a good consultant does, so that she can quickly understand your needs and make the right associations from the wealth of information overload that is floating around the CSR ecosystem, quickly analyse what's relevant for your business and make appropriate observations and recommendations. Why would a CSR Manager want to do all this? And how could a CSR Manager do all this without diverting her own attention from the core of improving business CSR capabilities. My clients, and I suspect my colleague consultants' clients, know that this high level expertise is worth budget, but not capex. Why buy the Chunky Monkey Machine when you can buy the Chunky Monkey? This, of course, assumes you want to deliver a good product - a good strategy, a good policy, a good program, a good report. Each organization has to judge to what extent this external expertise is necessary for them to achieve their objectives. Save time not reinventing the wheel. CSR consultants have methodologies and tools and process which save time. I am working on producing a Communications on Progress for the United Nations Global Compact right now for four different clients, each with a different core business, a different need to communicate and at a different stage in their overall CSR Activities. Each facing different dilemmas and holding different hopes about what such a Communication process will do for their organization. Whilst the style, tone, content and length of each communication will be different, my base methodology and approach saves each client a significant amount of time. Same goes for Sustainability reporting. I hear many Companies who embarked on their first reporting process describing months and months of activities, some even more than a year. Consultants can, and I can prove this from experience with my own clients, reduce the lead-time for the reporting process, precisely because they have done similar work several times over and know the process, pitfalls and opportunities. Recently a client asked me to produce an analysis of various sustainability metrics for SRI Indices. I was able to do this in a few hours because I am so familiar with the tools involved. A newcomer to the field would probaby have taken twice the time. Don't expect to see everything from the inside. CSR consultants are able to spot things that are dissonant within the organization that might not have picked up. A recent example is a client of mine who has outstanding "green" credentials, adherence to leading "green" standards, great green technologies and excellent tracking of all environmental metrics which show strong reduction of environmental impact over time. This, however, is not leveraged by the marketing function, and appears nowhere in the Company's marketing literature, product information or website. A clear instance of internal silos which a professional on the outside looking in can clearly see. I did so and pointed this out to the marketing team, and I will bet any money that this will be addressed in the coming months. No-one wants to waste an opportunity. Of course, this could have been spotted internally. But, it wasn't. I could offer many more examples from the the last few years and several clients. The plain fact is, that it's hard to see everything from the inside. Sometimes, someone else needs to say it. Having been on the "inside" in global businesses for so many years, you just have to realise that sometimes, the internal voice is not the strongest one, no matter how right it is. Sometimes, the divergent (did someone say political?) forces in an organization prevent the right recommendation from winning the day. Sometimes, the perceived authority of an external expert is what it takes. This is why, for example, I was the one to deliver training in sustainabliity to the Board of Directors of a leading financial services group, and recommend a Board procedure for CSR leadership, which the Board then adopted. Coming from the internal CSR Manager, this might have carried less weight. External reality is on the outside. CSR is about direct and indirect impacts. Direct impacts need to be managed internally, they are about how the organization behaves. Indirect impacts are the things an organization does that carry its influence well beyond the scope of its internal actions. How does an organization know what impacts it is having? How does an organization know the context of the external reality that is is competing in? Dialogue with stakeholders, sure, but which stakeholders? What issues? What questions? How can the organization know what it doesn't know? A good CSR consultant will have the answers to creating the picture of this external reality. A recent project of mine for a global client was to map the entire social media landscape for CSR communications in Europe and recommend a social media approach in Europe for their business. I knew how to do this. I spend half my life in social media and CSR. I knew what they didnt know and where to look for it. I could bring them their external reality. In other cases, and this is particularly relevant when we are writing CSR reports, clients sometimes need to be aware of competitive activity in the CSR field, because reporting naturally is an opportunity for someone somewhere to create a benchmark. We never start a report without first mapping all the relevant sector reports and listing all the material issues that show up. Of course, that could be done internally. But when the CSR Manager is spending all her time looking for and reading reports, she is not advancing CSR in the business. Leave time to go to the beach. How much can an internal organization handle? A business has two choices, Resource up for all the internal needs to do any job, not just CSR related work. Or have a lean team focusing on the core value adding work and use external experts to provide what is not-core and / or is overly time-consuming. When all is said and done, work-life balance is part of CSR and if your CSR Manager needs to do everything in -house, unless she has a very large team, she may just not have time to go to the beach. It's cheap. It's cheaper than getting it wrong (I was recently approached by a Company who write their first CSR report internally. The report is bad. They are now looking to hire a consultant to clean it up, correct it and upgrade it). It's cheaper than maintaining an expanded team. It's targeted expenditure to deliver improved business results over time. A good consultant should contribute more than the value of his or her fee, though sometimes this is hard to quantify with precision. So there you have it. This is a totally subjective view. Bit like asking Santa what he thinks about Christmas. (note: seasonal flavour for this Boxing Day post). Complexity levels of internal (CSR) processes. Oh, and a good CSR consultant also tells his/her clients when they don't need him/her any more. Because you won't need your consultant forever. Which is one of the reasons you hired him/her in the first place.. Here is an interesting way of creating BUZZ with a CSR report from the Daiichi Sankyo Co Ltd. I refer to their Corporate Social Responsibility Report for 2008. This is the third report from this Japanese pharma and biotech Company, a 52 page PDF which is inspired by GRI guidelines but does not index the GRI Framework. The Group prides itself on its innovative pharma for addressing lifestyle diseases, including thrombotic disorders, diabetes, cancer, autoimmune diseases and more. The Group sells around 900 billion Yen of products and employs around 15,000 people. What is surprising, refreshing, outstanding about this report is its focus on dialogue with stakeholders. The entire first section of the report, almost a third of its content, is dedicated to detailed approaches to dialiogue with different stakeholder groups. The cherry on the top of this process is the inclusion of a section that preceded the writing of the 2008 report - the two-phase Report Reading session conducted in order to gain stakeholder feedback. Daiichi Sankyo sent a questionnaire to 159 external stakeholders (consumers) and received 123 responses. Of these, the Company invited 11 individuals to a dialogue session. The Group was split into two, to work on two themes: (1) Creating a better report and (2) Making the report easier to understand. The feedback provided by this group is disclosed in the 2008 report. What prompted me to look at this report was a similar Report Reading session for the 2008 report which I found on the Internet. This time, the target stakeholder group was 19 Students from a local University School of Business. The themes of this second discussion were more focused (corporate positioning, relevance to stakeholders and quality of the report as a communication tool), the feedback from students more direct and the response by the Company relating to what would be adopted in the 2009 report more transparent. I like this. I believe this is best practice. A while ago I wrote a post about making your CSR report BUZZ. Now obviously, Daiichi Sankyo had implemented these practices before I produced my post, so I cannot take credit for any indirect influence here whatsoever (unless they were influenced by ultrasonic brainwaves from half way accross the world) . But it looks to me as though there is definitely a BUZZ in the way Daiichi Sankyo create dialogue around their report, and benefit from it. Well done . I believe this is a model for others to follow. Domo arigato. San. Twitter makes CSR info accessible to more people more of the time. With hundreds of CSR and Sustainability and Green tweeps tweeting their CSR news items or other CSR interest items, the world cannot fail to be more aware of many new aspects of CSR and how it is evolving as we speak blog tweet. Awareness in itself doesn't make all that much of a difference. But awareness is a precursor to action. Just by making people aware, you change their paradigms, and new paradigms bring new motivations and new activities. I have no data, but I would bet any amount of chunky monkeys that CSR tweets have driven CSR actions to a great degree in these last few years. Twitter IS CSR conversations. Of course, Facebook, LinkedIn, Justmeans, DevelopmentCrossing and many more networks offer conversation possibilities. But Twitter does it quicker, faster and more directly. Limiting to 140 characters forces you to choose what you want to say very carefully. Just look at some of the dialogues happening on Twitter around COP15, or human rights, or employee engagement. They may not have the richness of a Linkedin thread, but people are getting their points of view across. I believe this is changing the way people are talking and thinking about CSR. Twitter brings CSR leaders closer . The wealth of twittering CSR celebs such as Ray Anderson of Interface (@RayCAnderson) , Jeff Swartz of Timberland ( @Timberland_Jeff) , Jeff Hollender of Seventh Generation ( @JeffHollender) , Kevin Moss of BT ( @KevinIMoss) , Richard Branson of , well, Richard Branson ( @richardbranson) , Fadi Ghandour of Aramex ( @fadig) Dave Stangis of Campbell Soup ( @dstangis) , and CSR thought leaders such as Noreena Hertz ( @NoreenaHertz) , Christine Arena ( @christinearena ) , Rosabeth Kanter ( @RosabethKanter ) Adam Werbach ( @adamwerbach ) , Joel Makower ( @makower) , and CSR organizations such as CERES ( @ceresnews), the GRI ( @GRI_Secretariat), make the possibility of conversing with these leading lights, understanding what's important to them, hearing their insights and following their example. This is what future CSR leaders aspire to and are inspired by. Equally, I am sure that the CSR-tweeting leaders are thereby exposed to quesions, feedback and reactions that that are uniquely twitterous, i.e. that they would otherwise have no access to. And this helps them build their own thoughts and positions and leadership. Twitter stages CSR connections. People are meeting each other, creating partnerships, making deals, doing new things in the CSR space. Connections and actions that would never have been possible on slow networks such as Facebook or Linked in. Twitter is fast and furious, creating fast and furious changes in the way people are working together across country borders. Twitter is just one big CSR conference. It is probably true to say that someone is tweeting from every single CSR conference or event, wherever it is happening in the world. So what would normally have been a closed meeting for the privilege of the privileged few is now an open newstream of insights from inspiring CSR folks for the accessibility-challenged many. This is helping to create greater interest in the CSR body of knowledge which is evolving as we blog. Twitter is now core in CSR comms strategies. HP, Fedex, Microsoft , Intel and many more are tweeting their CSR updates. 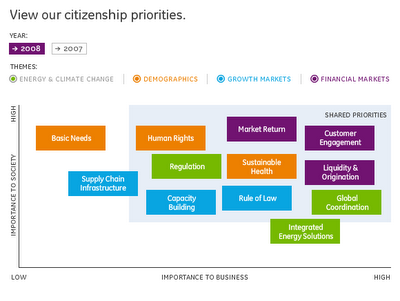 This is a tool to engage both internal and external audiences (us CSR folks call them stakeholders). Think back to a couple of years ago. What comms routes did companies have to spread their positive news and engage in conversation about it, with just about anyone? Twitter is a CSR jobs recruitment platform. At least once a day a CSR job is posted on Twitter. Or should i say once an hour. Because it seems like that. Twitter announces CSR reports. Every CSR report published is announced by someone somewhere on Twitter (oops, its me, more often than not) (haha) Often, highlights from the report such as ghg emissions reduction, or community invesment, or a CEO statement are tweeted as well. I think Twitter has become a platform for creating awareness of CSR reporting in a way which has never been achieved through press releases, websites, email, or RSS. Note that I havent mentioned the way Twitter is used to promote brands, or the way it is used for customer service, or to announce new products and services. All these link to CSR as well, in one way or another. All in all, Twitter is a CSR communications tool , more than anything we have ever had at our disposal in the past. So now, Cindy, you know what I meant. But I am glad you asked me to spell it out. Who will win the CERES -ACCA 2009 Awards? Who won in previous years ? There were awards in 2002-2004, but you will have to look these up yourself. haha. For a report to be considered, the reporting Company must apply. This is standard for most reporting awards, I think, including CRRA 10, CorporateRegister.com's annual awards, with the exception of the GRI Reporting Awards, in which every single report published last year competes for readers' votes. A few things strike me as I look at the shortlist. First, all the shortlisted Companies are seasoned reporters, some having reported since the 1990's. Guess that knocks the Best First Timer award on the head, right ? Which is a shame, as the first report is always the toughest, and often the most interesting and creative. Some Companies, once they get into the routine of reporting, produce a routine report. Second, as far as I can tell, Seventh Generation is the only shortlisted SME. Are they still an SME? They sure make a lot of (good) noise for a little Company. But their report, as is their leadership and general approach to sustainability, is creative, fun, serious and one of the best around. And I checked. Whilst 7th Gen does not disclose financial information, so we have no idea how many billions of $ profit they are making, they do employ only 93 full time people, which is one measure of Company size. But why is this the only shortlisted SME? Did no other SME's apply ? Or did the judges not select the categories in advance and shortlist against category ? Either way, either 7th Gen makes it a hat-trick this year, or they go head-to-head with the big fish. Third, there is a little thing about reporting that concerns transparency. Level of transparency is not stated explicitly as a judging criterion, though the "completeness category" (40% of the total score) includes reference to the level of detail included in the report. But if I were to take the GRI Application levels as a guide to the degree of transparency, I find only 4 reports making the top grade (A level): Suncor, AEP, Ford and GE. Fourth, one of the judging criteria is Assurance, part of the "Credibility" judging criterion (35% of the total score). Only two of the 14 shortlisters were assured : Bristol Myers Squibb and Suncor. I must have picked at least one or two winners with this selection, right ? What I wonder, though, is that of the 500+ additional reports which were published in North America, Canada and Mexico in 2009, and did not apply for an award, which are better than the ones that will win ? Last week , I enjoyed the privilege of being interviewed by Sherie Winston who writes for the CSIC Blog : Rocking the Boat. The CSIC is the Center for Social Impact Communication at Georgetown University, creating "leadership opportunities for communicators who want to use their skills for positive social impact". Whose job is it and do the leaders excel ? What sets Companies apart ? Whose job is it ? Each post offers a different perspective on the way the CSR message gets through (or not), based on a thorough and intelligent research study of 20 Companies including GAP Inc, Fedex, Microsoft, Nordstrom, Cisco, American Express, Starbucks and more. I thoroughly recommend you read all six posts and the research report itself which you can find here. The first, entitled Thoughts from the Thought Leaders, covered a little of my professional background and the work we have been doing to educate for an ethical supply chain in the Israeli fashion industry. The second, entitled CSR Reporting: Changes are needed covers my thoughts about CSR and Sustainability reports, a subject, by which you may now have gathered, I could talk about till 2025. I was happily amazed (and relieved :-)) that Sherie had reflected my sentiments perfectly in both pieces, whilst pleasantly surprising me with creative ways of presenting the thoughts. This is a great tribute to her journalism and writing skills. I was also pleased to have another outlet for some of my messages on CSR because, to requote myself (I am usually much more modest, honest! ), in the CSR business, "we work to create the market we serve" by creating awareness and understanding of the risks and opportunities that CSR brings, and the benefits of transparency and reporting. Thank you , Sherie. A triple Chunky Monkey (virtual , sorry) is now zooming through cyberspace towards you. Disclosure: this is a sales pitch! I am not sure if it is protocol to use your blog to advertize your services. I haven't done before (ok, well, maybe a teeny weeny super subtle plug once in a while) . So as we are approaching the Holiday Season, where people are filled with joy and goodwill, I am hoping will forgive me if I make a brief departure from my usual writing and commentary to make a little offer relating to one of our Reporting Services. By now, you know i am passionate about Sustainability Reporting and love to work on reports. REVIEW of your final or almost-final draft report, provision of feedback and recommendations for improvements for your internal use as you finalize the report for publication. ASSESSMENT of the readability and credibility of your report and suggestions of ways which might enhance appeal and credibility, including checks for consistency with previous reports, if this is not your first time. ANALYSIS of your report against GRI indicators to provide a Third Party Check of the Application Level, including gap analysis of contents versus the GRI index or the Global Compact Communication on Progress. PROVISION of a consultant's statement relating to the quality, materiality or any other aspect of the report which could be printed as part of the report as it is finalized. I can offer fast turnaround, high quality analysis and commentary, sharp assessment of what's appealing and what's not about your report, and pertinent recommendations, based on years of experience writing, analysing and reviewing Sustainability reports of all types from all sectors of businesses around the world. Of course, if you havent started writing your report, well, I would love to write it :) If you would like an external verification of your report, I could do that too (I have IRCA and AcountAbility Sustainability Practitioner certification). If there is anything else you think I might be able to assist with relating to your reporting process, I would be happy to talk. Please contact me directly via my Company website for all queries.You can see a range of published report reviews I have written this year here. Thank you , and apologies to those whom I may have offended with this sales pitch! Promise I won't do it again (till next Christmas!) . Good luck to all you reporters out there, and Happy Holiday Season! I would like to take this opportunity to wish all my readers a Happy Holiday Season.And in the interests of diversity and inclusion, I offer some special wishes to individual reader stakeholder groups. To all my readers who are dyslexic from reading too many CSR reports - Have a Crappy Histmas !! An interesting discussion on Justmeans with Gil Friend, founder of Natural Logic, and Dave Stangis of Campbell Soup Company prompted this post. I mentioned in one of my Justmeans updates that I had been designing a questionnaire to seek employee reactions to a client Company's first CSR report. You can read the ensuing discussion yourself, but one of its offshoots relates to one of my mantras. That it is incomprehensible to me how much work goes in to the publication of a report, and how little goes into ensuring it reaches, and touches, one of its primary stakeholder groups, the Company employees. I will explore that a little here. Senior Manager Round Tables - Starting with the CEO, discussion sessions on specfic themes in the report, or aspects of the report, with random groups of Managers.Round Tables could be designed as open discussions about material issues, the challenges and the dilemmas, based on what is presented in the report. This also serves to ensure Senior Management read the report (! ), and reinforces their commitment as they are seen to walk the talk. Group discussion sessions in organic teams - Using single sections or even cases studies or paragraphs in the report, conduct conversations about the content within organic teams , based on focused questions of the specific sections - Why is this important? What can we learn from it? How does it relate to our job? Does this feel like a fair representation of the Company.? What could we do better? Who are the stakeholders affected? How does this fit with our overall sustainability goals? What can we contribute? What should we think about or do before the next reporting cycle? Fun activities for familiarization with the report - (Gil Friend suggested something like this and i agree) - ranging from quizzes, report trivia, team competitions, report crosswords, report awards (best photo, best case study, best quote), best rewrite (!) etc. This might include report memorabilia :)) such as "I reported 2009" T-shirt, "Reporting leads to better performance" mousepads, " This is my CSR report coffee cup" printed on guess what, a coffee cup. What about starting a graffitti wall, much as Anita Roddick described in Business as Unusual? Not everthing has to cost money. Employee survey - I think it is absolutely essential that Companies survey their employees to see how many are taking an interest in the report, what they think, and what they would improve. Training activities - Every Company spends so much on training, this often includes leadership or strategy training - the Company's sustainability report is a window to the Company's leadership, or should be. The CSR report should be an essential part of leadership training. Even if the report is awful, the dialogue that training workshops generate could be useful in helping to make it better in its future rebirths. Equally, the report can serve as material for training exercises in identifying business opportunities, risks or ethics training for employees. New hire orientations - Every new hire should be directed to read the report, and part of the new-hire orientation program should include a discussion about their impressions. Is that such a hard thing ? You join a Company, you want to know about it. Is reading the CSR report such a burden ? When I joined Procter and Gamble in the days before anyone had even dreamt (or had nightmares about) CSR reports, I was given a copy of "Eyes on Tomorrow" by Doubleday and Ferguson, a very detailed and at times rather stodgy history of the Company, but i read it from cover to cover. Performance Scorecarding - Perhaps the Company has a Balanced Scorecard, or some other form of performance management system. If so, sustainability performance is probably in there somewhere. If not, the commitments or intentions stated in the Company's report should be measurable, and measured. The results should be widely communicated. Different Communication Formats - Exec summary, briefing papers, webcasts, video summaries, posters, Q&A briefs etc, use of company intranet forums if they exist, perhaps even an online marathon with Senior Management and the Reporting team who respond to quesitons live in real-time. In many cases, unless the reporting is a one-person show (and, regrettably, it sometimes is) , many employees will have contributed to the data and information contained in the report. Doesn't it make sense for them to be consulted about the report once it's issued ? Not only as a way of showing them respect, as core stakeholders, but also as a way of gaining essential information about whether their input was appropriately reflected. I think you get the picture. When planning your report, make sure you plan beyond publication - at least six months ahead. Plan six months of intensive employee familiarization, understanding of and engagement with the report. At worst, employees become aware and can be more adequately equipped to support the Company's sustainability objectives. If this is all they pick up, it's a benefit. At best, they become so engaged that they begin to see sustainability opportunities in everything they do, speak out passionately against unsustainable practices and turn every external interface into one in which the Company's values and sustainablilty practices are promoted. Give me a CSR report, tell me about the process of writing it, and I will design an employee engagement process for your Company around it. Why ? So that your next report will be even better. Why ? So that your business performance will benefit. CRRA 10 How will you vote? You WILL vote, right?